Finance Minister Mr. Arun Jaitley in his budget speech reduced income tax cash payment limit under section 40 A (3) from Rs. 20000 to Rs. 10000. This rule will be applicable from 1 April 2017. So the limit to take cash from one person in one day is reduced to 10000. Full rule is as under. 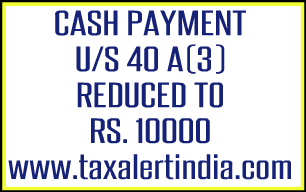 1- Section 40A(3) a It provides that any expenditure incurred as a payment in sum of exceeding Rs.20000/-(From 1-4-2017, 10000 Rs.) otherwise of paying with payee account cheque, demand draft or any transaction made by banks like RTGS, shall not be allowed as a deduction. However if payment is being made for hiring or leasing, the limit is 35000. 3- Section 40A (3) It provides that the payment in a single day should not be exceeding Rs. 20000(From 1-4-2017, 10000 Rs.). It doesn’t mean the single payment shouldn’t 20000 but the aggregate amount should not exceed the limit. Some parties split high value payment into several cash payment for evasion of section 40A (3) a, so this rule is for evasion of payments.